Be cautious. Have you ever found yourself, that day, fooling around in the bike shop, looking at mediocre bikes with modicum price tags when a clever little salesman decides to reel in your interest by quoting Donnie Trump (see above) ? And then he escorts you like a long lost brother towards a sleek and voluptuous looking bike hanging on the wall at the premium end of the shop. Your eyes suddenly widen and you stare at it for a long time. You are entranced as it captivates you in a spellbind. You are gaping like a hippo. You are literally drooling from the mouth. There is a puddle of it near your feet. Now there is so much of it that it has become a scaled down human version of Lake Baikal. Like a child who first wet his bed, you slowly furnish him your embarassing wallet with a strange sort of smile. Perhaps blue from shame, the last thing you do to save yourself is flick the lone green colored penny from in there like David Blaine the magician and quickly wipe it off with saliva to clean the copper oxide. "Its okay, " he says in a morose tone and pats your shoulder. Then he points you to the door as he turns around to help another customer. His face has a smirk that you never caught properly. "The exit is that way," he finishes off. Its high time school textbooks corrected themselves. Mayflies don't have the shortest lifespans. I certainly haven't come down to the level of desperation you describe (thankfully!). But its interesting that at my bike shop, there's always a few hard-pressed individuals from the neighbourhood touring the bike shop, marvelling at the luxuries of capitalism they could never dream to even touch, leave alone buy. Its funny, also a little sad. Why does that bike cost 15 grand? Not even Lance Armstongs hand built Trek costs that much? I think P.T. Barnum said it best when he said,“There's a sucker born every minute”. 15,000??? And its still stuck with 10 speed record on it. Not fair. @Jason : Thats why there's Ebay. Isn't it amazing there's a fine balance to this world? Or someone would make me bankrupt by now. Beautiful writing - that hurts. Gonna have to go give my CAAD8 some love now. At least she's loyal - and paid for. 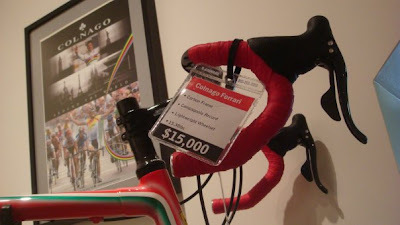 A $15000 bike is absurd. 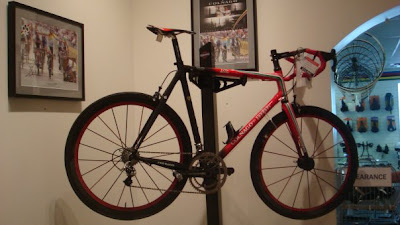 I recently saw a Trek with Lance's autograph on it in a bike shop for $9500. Anything more than about $4000 is pure extortion. With a little internet research and determination, anyone can put together a spectacular bike with top-end components for a fraction of what bike shops charge. I love this fresh blog. It gives me a break from all the Lance Armstrong fueled 'news' and unwanted commentary on others.